A crack cocaine addict had a nasty welcome for firefighters who came to help him – pulling a knife on them. Kevin Gillon (41) was “agitated” when fire crews arrived to deal with a suspected blaze at his property, hurling abuse at them and showing them the lock knife. 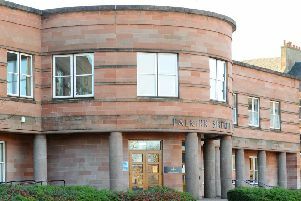 Appearing at Falkirk Sheriff Court last Thursday, Gillon had pled guilty to threatening behaviour towards the firefighters at his 70 Chacefield Street, Bonnybridge, home on April 13, 2016. He also admitted threatening staff at Forth Valley Royal Hospital on September 13, 2017. When the firefighters got no response from their knocks on the door they forced it open and were greeted by the sight of Gillon standing in the hallway. Mr Maguire said: “He eventually agreed to leave the address. He removed a lock knife from his trouser pocket which he then began to open. he then quickly folded up the knife and put it back in his pocket. Sheriff Derek Livingston placed Gillon, who actually fell asleep in court, on a supervised community payback order for two years and made him subject to a restriction of liberty order for fourth months.